The games produced by the six teams were judged by Nate Lanxon (Wired.co.uk editor); Bennett Foddy (rock star game maker and Deputy Director of the Programme on the Ethics of the New Biosciences at Oxford), Charlie Hasdell (Principal Designer for the game SingStar); and Danny Altmann (Head of Pathogens, Immunology and Population Health at the Wellcome Trust). That's a panel with expertise in both game play and science. The winner was a game based on the work of biologist Margherita Coccia, whose doctoral research focused on the pathogenesis of inflammatory bowel disease. 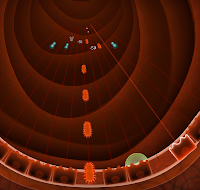 Working with a team of game developers from Clockwork Cuckoo and Force of Habit, they created Dysb'os's (or Dysbiosis), a scientifically accurate shoot-em-up. You control intestinal cells, which need to destroy oncoming bad bacteria, while letting the good bacteria survive. Accurate shooting lets you build up a mucus shield, which gives your cells protection. But if too many bad bacteria survive you lose. That's very much the way your gut is supposed to work, at least in broad outline. Dysbiosis refers to a microbial imbalance within the body. Abnormal growth of bacteria in the small intestine is associated with irritable bowel syndrome. Watch the demo video or download the game. I think it's a fun concept: use tried and true game mechanics with a "story" based on science. You can't help but learn a bit of basic biology as you advance through the game. And I appreciate the simplicity: a Fantastic Voyage-like game with fancy graphics would likely look beautiful, but I would find it harder to get into the game play than I would with a simple yet addictive shooter or puzzle game. More of those please! • Monsieur Baguette presents RNA transcription of Saccharomyces Cerevisiae by Jane Elizabeth Anne Reid with Opposable Games (video clip only). It's a pattern matching game based on the function of the enzyme RNA polymerase II in the synthesis of RNA. • Simalaria by Thomas Forth with Mobile Pie. This is a resource management puzzle game that models the metabolic reactions in malaria. Can you help the parasite survive? • See the related article at BioTechniques with links to all the games.